Or more correctly, 'Garden path with chicken', by Gustav Klimt, painted in 1916, destroyed by fire at Immendorf Castle, Austria, in 1945 (for a really interesting article about that fire, here's one from the UK's Guardian newspaper). 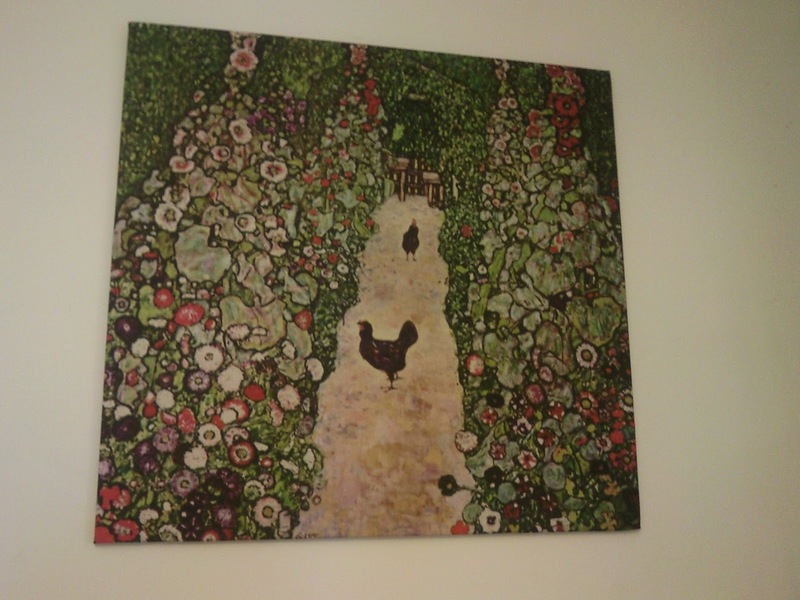 What's not to like - it's green, it's Klimt, it's chickens (I'm wondering if they had Australorps in Austria in 1916?!?! I'm not sure what breed they would be otherwise)! The pathway motif also really reminds me of Monet's garden at Giverny, near Paris, which I was lucky enough to visit in 2011. This lovely copy was printed just for me by the lovely folks at Big Quince Print, in South Australia. It measures around 85 x 85 cms, and has pride of place on my kitchen wall.